Like many wireless customers, I live in fear of the day I go over on my data usage. I worry that one day, I'll open my bill and find that watching Sammy the Squirrel 132 times has increased my payment by a decimal place or two. That's never happened, and I doubt it will. But the spectre of that day still looms, so I tend to be pretty stingy with my data usage. I really like the BlackBerry Podcasts application. Podcasts are (relatively) huge files of 30, 40, even 100 MB. Like any good podcast application, it limits what it downloads over your mobile network, preferring to download only while connecting on Wi-Fi. That's not always enough. Sometimes the CrackBerry Podcast goes up when you're nowhere near Wi-Fi. No Problem, as long as your data plan can handle the large audio and video files. Just change one setting. 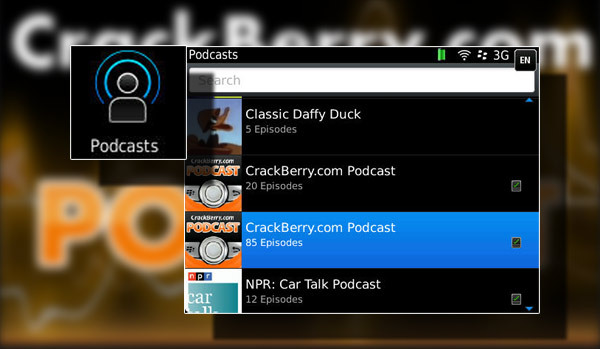 On the main BlackBerry Podcasts screen, press the menu key and select options. Under Podcasts and where it says "Download Podcasts using:" change Wi-Fi to Wi-Fi and mobile networks. Once you've saved changes, you can check on your podcast's status by selecting Podcast Downloads from the menu. When the file is done, you can change the setting back to Wi-Fi; you don't want to kill your data plan. You can also download individual episodes instead of subscribing to an entire feed. Simply Explore podcasts to find an interesting feed. From the list of episodes, click one to get a brief description. Once you've decided to listen, click download and just that one episode will be downloaded to your BlackBerry. In closing, be mindful of your data usage, but don't be afraid to use it, either. Manage what and how you download to get the most out of your plan.